In frequent flyer forums, I keep seeing the same question: If my flight is cancelled because of weather, do I have to wait for an award seat at the same redemption rate to open up on another flight? Since the beginning of December, more than 75,000 domestic flights have been cancelled, the highest number since the Department of Transportation started tracking flight cancellations. That’s a lot of award tickets affected. 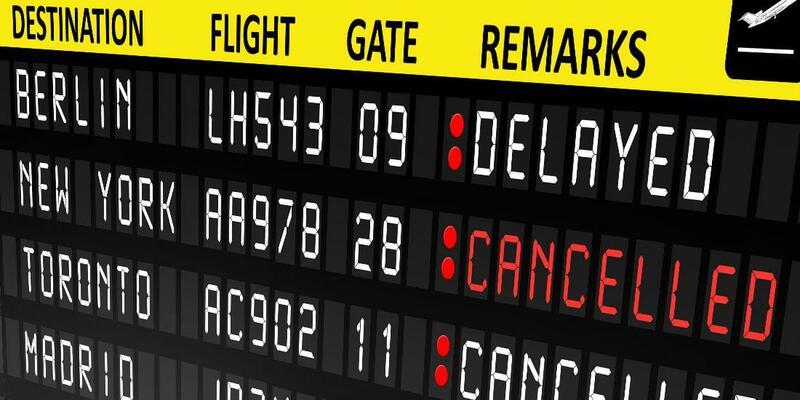 Though we’ve seen a record level of flight cancellations this winter, there are always cancellations. And airlines are fantastically vague—to the point of being mute sometimes—in regard to how cancellations affect award travelers. Knowing where you stand when flights get cancelled can save you hours of phone time down the line. Thankfully for travelers in general, the government has finally stepped in to make some demands on airlines in terms of how they treat both passengers and crew. The airline must get you—and the thousands of other stranded passengers—on the next available flight to your destination. And you are entitled to certain refunds depending on the amount of the delay. But how does this affect award travelers who haven’t paid cash for their fare? Are you stuck waiting until another award seat opens up? Do the paying travelers get rerouted before you? While there is typically great award availability for last-minute flights, this is not usually the case when flights have been cancelled and all available seats are filled with rerouted passengers. Thankfully, you don’t have to wait for one of those. The airline must put you on another flight, whether there is a vacant award seat or not. And, if your ticket is for business or first class and space is not available, the airline can often rebook you in coach and offer a partial refund. To make sure that you don’t get hit with cancellation fees, award redeposit, and close-in booking fees when you get on a new flight, it’s important to make sure that your new flight corresponds to the letter of the airlines cancellation announcement. There are a lot of different waivers going around this year. Some waive only change fees, others waive both change fees and fare differences. Some only allow you to rebook your flight within a few days of the original flight. And some allow changes, but not cancellations. During the big storm at the end of January, Delta allowed passengers to get a refund on their tickets though the carrier was mum on redeposit fees for award travelers. 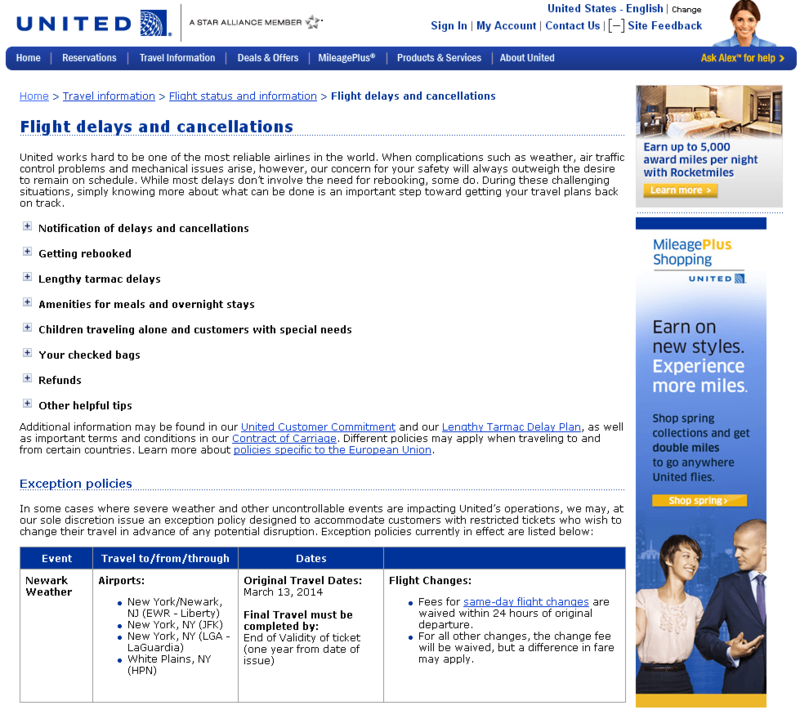 Other airlines only allowed changes within 24 hours of the original flight for another flight to the same destination within three days if the flyer paid the fare difference. These highly restrictive change waivers are the norm and written with revenue ticket holders in mind. For award travelers, change fees are also waived as long as you stick with the restrictions in the announcements Refunds can be murkier. When you are hit with a fee, you’ll need to refer to the announcement when you battle it out with airline employees to get your money back. 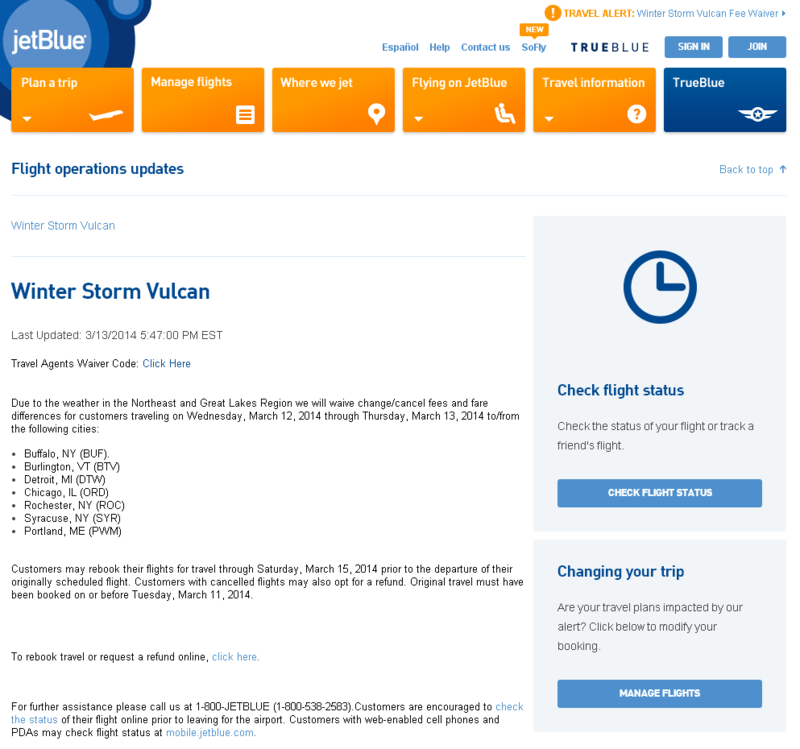 If you didn’t get the announcement via automatic email when your flight was cancelled, search for news announcements of the cancellations on your travel dates. They often include each airlines policies verbatim. If you click through but the waiver is no longer on the page, use Google cache search. In the search results page, next to the truncated URL, click the “cache” button to see an older version of the page that has the information you need. Copy it and save it. I grew up in California, but my extended family lives in New England and I also went to school there. I grew up flying back and forth many times a year. And one thing you learn when you fly coast to coast: hub airports are no place to be in a storm. Chicago O’Hare, while generally a nice airport, became the bane of my existence as thunderstorms seemed to interfere with at least half the connecting flights I had to take traveling back and forth. During the current storm season, it’s almost a given that flights through hubs are delayed or cancelled because they can’t get through to certain cities in their routing, but that does not mean cancellation waivers extend to cities outside the weather-affected area. Before you look to rebook your flight, double-check which cities are listed in the cancellation waiver before re-booking your flight yourself online or by phone. If your flight is not eligible for a fee-free rebooking, go through an airline gate or phone agent directly,and get confirmation in writing that there are no redeposit and close-in booking fees for your new award ticket.